Both of our boys have a habit of pulling books from the shelves in their rooms, reading them, and then scattering them around their beds and floors rather than putting them back away. If I don't say anything to them about it, the books pile up like a fortress over a few days, until getting into bed at night comes close to requiring a pole-vaulting exercise or something similar on their part. I do not understand this book keeping system at all, and wonder sometimes how big the book piles would get before the boys did something about them without being asked to. Despite the fact that the massive book mountains in Noah and Will's rooms make me a little crazy, they also make me really happy -- because who doesn't love to see their kids enjoying books, books, and more books? If you live in Canada and would like to encourage your children to enjoy some reading over the summer, head on over to your local library and sign up for the TD Summer Reading Club. We have participated every year since the boys were very small, and Noah and Will always have lots of fun discovering new books and keeping track of what they've read to show the librarian each time we visit our library. The boys and I are back today to share a few more good kids' reads with you. The three of us sat and talked and wrote about books together last night, and these are Noah and Will's latest recommendations. 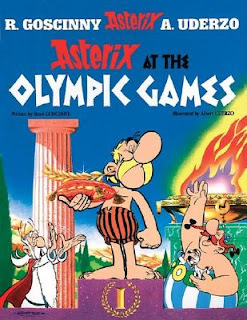 Open up the pages of an Asterix graphic novel and enter a world of adventures involving Roman soliders, Caesar's evil plans, the druid Getafix's magic potion, and of course, wild boars. Follow Asterix, the Gaulish hero, and his pal Obelix as they foil Roman plots to capture their village, compete in Olympic and gladiator games, or rescue one of their fellow villagers. The graphic novel format of this series makes the books very entertaining to read, and the combination of humour with action keeps the reader laughing throughout each book. Even if you think you don't like reading, you'll like this series. 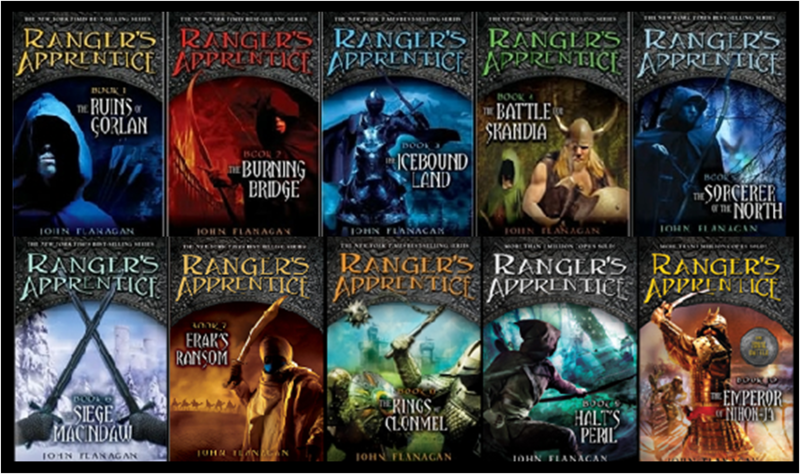 The Ranger's Apprentice series follows main character Will over a period of fifteen or so years, from the time he is an orphan, to when he becomes the apprentice of the most famed but mysterious man in the kingdom of Araluen, to when he emerges as a highly skilled warrior. The books are full of intriguing conflicts, suspense, adventure, and oh-my-gosh-is-this-really-happening?! moments. The first book really grabbed my attention and I was excited that there were still many more novels to read in the series. I would recommend these books to anyone who enjoys thrilling fiction set in medieval times. 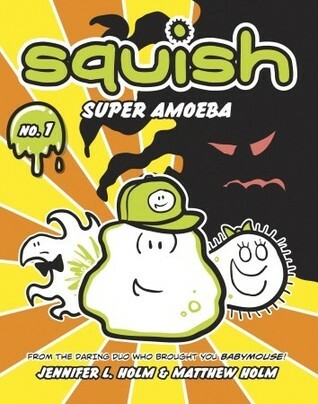 The squish books are a series of graphic novels about a little ameoba and his microscopic world. While the books' characters are a variety of slimy blobs, their experiences are very much like those of many school-aged children, and readers will easily relate to squish as he tries, like his favourite comic book hero, to have the courage to do what's right. Appealing illustrations, a quirky running commentary in captions, and interesting science facts scattered throughout the books' pages make these little novels an engaging and entertaining read. 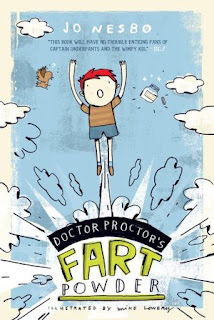 What do you get when an unusually tiny red-haired boy named Nilly and his new neighbour, a lonely girl named Lisa, meet a wacky professor who has invented an extremely powerful fart powder? An adventure that's a real blast! Readers will cheer as the story's unlikely heroes go to incredible lengths to keep the fart powder out of the wrong hands. This novel is full of the kind of low humour that kids always find hilarious, but it's also a very clever and well-written book. (Will tells me that he likes the book because it's funny, but it's also set in Norway, which he thinks is very interesting, and it uses big vocabulary.) Children who enjoy this novel can go on to read more fart powder adventures in Nesbo's two sequels to this book. If you're looking for something to keep kids' brains and hands busy over the summer, the Star Wars Folded Flyers book by Klutz is a great place to start. I bought this book for Noah and Will and their cousins, Ryan and Megan, to enjoy over the March Break, and all four kids absolutely loved making the different paper spacecraft projects and flying them all over the house and yard. 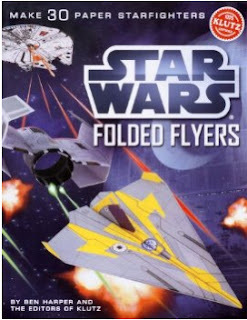 The book contains enough paper and detailed instructions to make five of each of the six different Star Wars starfighter designs (which is great because then there is no arguing over who gets to make which flyer!) Kids learn how to carefully follow written directions to make each starfighter so that it will successfully fly, and it's very satisfying for them to launch the finished product and watch it perform in the unique way it was designed to. Has your family discovered any really wonderful books lately? If so, please share them in the comments section below (because Noah and Will are always looking for new ones to add to the mountains on and around their beds!) Let's all keep our kids reading over the summer.